There are a lot of different brands of SUP boards on the market. One of the most well-designed brands for surfboards, paddles boards, and accessories is Isle Surf and SUP. Isle SUP boards are designed to ensure that you have a great adventure out on the water. Isle Surf and SUP was started by two college graduates, who were surfers from San Diego. They left their corporate positions to start designing new products that embraced adventurers of any age and any skill level. Today, the company has grown to become one of the largest premium retailers of paddle boards worldwide. If you are a beginner and just learning what is SUP or if you are finally ready to invest in your own paddle board, Isle SUP boards are an excellent choice. They have a variety of different types of SUP boards available; from soft tops to fiberglass and inflatable designs. With Isle, you are getting an investment that will ensure high-quality, an excellent performance, and reliability to go on a variety of adventures with the best Isle inflatable paddle board under your feet. 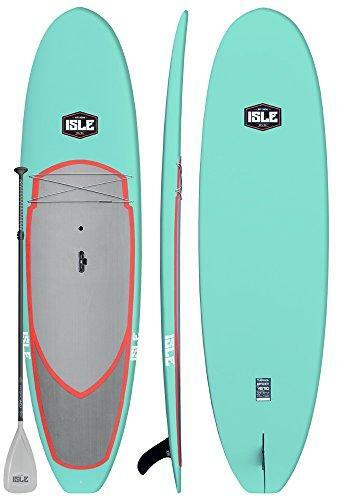 This design by Isle is one of the best Isle SUP boards. It is super durable and easy to carry. This board is 10 feet and 5 inches in length. It has a thermal molded technology, which eliminates waste in the construction process and creates a board that is lightweight and ultra-durable. It has a stylish design and a comfort grooved carry handle, to make it easier to transport. The board also included a traction pad, adjustable carbon shaft and plastic bladed paddle, as well as a center fin. It is the best all around Isle SUP board and is perfect for yoga, surfing, fishing, and riders of any age or level. Isle also includes a Ride It and Love It for 60 Days or Return It! Guarantee. 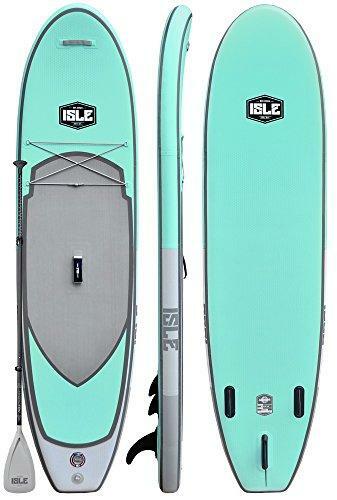 This Isle inflatable SUP features their new Airtech fusion-lite construction. It is lighter and stiffer, but more durable. It has a great all-around design that can be used on flatwater, river runs, and small waves. It can support riders up to 240 pounds. It is highly durable, so you can forget about dings or damage. You can easily attach it to paddle board car roof racks or pack it into your vehicle. The material is military grade and nearly impossible to damage. You can run it over with your car or ram rocks and it will remain damage free. It is perfect for travel. The kit includes a travel paddle, high pressure pump and gauge, a travel fin, and a repair kit. Isle includes their standard 60 Day guarantee. This Isle inflatable SUP has their Airtech construction, which offers stability for fitness. It can support riders’ weight up to 240 pounds. It has a wide nose and tail for a stable platform, so riders can practice yoga. It is ultra-durable with a military grade PVC construction. It is 6 inches thick and will resist dings. Included in the bundle is the paddle, a carry backpack, and a high-pressure pump. Isle also has their standard 60 Day guarantee and 1 Year Warranty. This design of the Isle Airtech SUP is great for adventure. It has extra gear storage for those who like to paddle off the beaten path. It is ultra-durable and constructed with military grade PVC. It will resist dings and damage. It can support a maximum of 275 pounds and takes just 5 minutes to inflate and deflate. Included with the purchase is an adjustable carbon shaft and plastic blade paddle, carry backpack, high-pressure pump, coil leash, snap in travel fin, and the Isle sticker pack and manual. Isle also included their 60 Day Guarantee and 1 Year Warranty. There are a few different types of paddle sports that are popular with water enthusiasts. A traditional activity like kayaking can be a fun way to spend the day, but the up and coming popular water sport these days is paddle boarding. There are amazing benefits of paddle boarding, which make this sport so popular. It is also a fun and new way to cruise the water and get some exercise. If you are looking to invest in your own stand up paddle board, it can be a little tricky determining which design works best for you. Isle is an excellent choice in a brand for your board, but they still have different designs available that you will need to choose from. 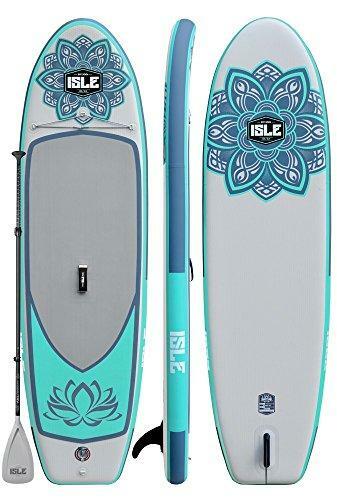 There are Isle touring SUP boards, Isle SUP paddle boards, Isle inflatable SUP boards, and Isle yoga SUP boards. You will have to determine which stand up paddle board activity you want to try, to ensure you are investing the best Isle SUP board that will suit your needs. You can go SUP fishing, SUP surfing, learn new yoga poses, or paddle board with kids. No matter what you want to do on a SUP board, Isle will have a design for you. However, there are a few different features that can help you determine which board would be the best for you. 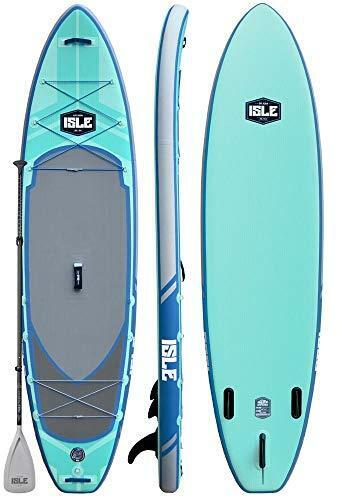 If take into consideration these features, along with Isle SUP board reviews, you guaranteed to find a top rated Isle inflatable paddle board that will get you cruising out on new adventures. The overall size of your board can be larger than you expected. Isle SUP boards are already large, but some designs can feel overwhelmingly large. The size of your Isle SUP board can make it hard to transport it to or from the water. To ensure you are safe, you should learn all the parts of a stand up paddle board, which can help you manage the size. It is important that you learn how to properly maneuver the board when it is in and out of the water. You should learn how to store your paddle board and how to transport your stand up paddle board to ensure that your board and you, stay safe. Learning how to store and transport your Isle SUP board will also ensure that your board stays in top shape and is a long-lasting investment. It is also important that you correctly size your board and correctly size your paddle. In general, longer boards are better for certain activities or beginners. While shorter boards should be left to those with experience. Isle SUP paddle boards come in a variety of lengths. 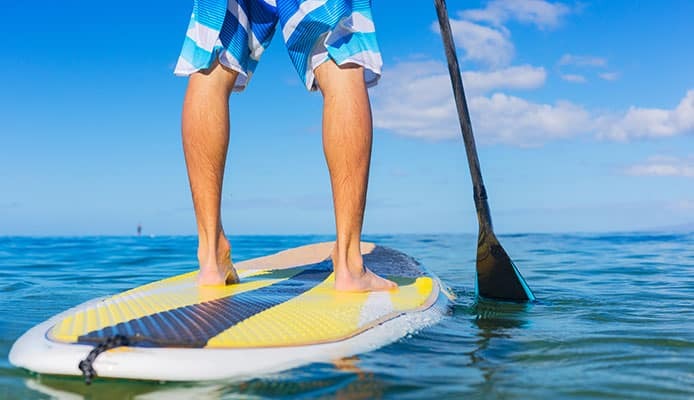 The length of your Isle SUP board will affect how the board moves through the water, how easy it is to maneuver, and how well it tracks in the water. The longer an Isle SUP paddle board is, the easier it will glide across the surface of the water. But remember, that a longer length also means it will be harder to maneuver you board in turns. Shorter boards have a better turning radius and will take less energy to paddle and maneuver. In turn, longer boards track better. Beginner and intermediate paddle boarders, you will want a board that is about 10 to 12 feet in length, or longer. Another aspect of size is width. Just like lengths, there are a variety of widths available too. The wider the board is, the more stable it will be. Yet width also means that the board will have more drag in the water, which will make the board slower or faster. Skinnier boards will move faster through the water. Beginner and intermediate paddle boarders should look at wider designs because they are more stable. Beginning paddle boarders can learn how to stand up paddle board and how to balance the board easier with a wider design. A wider design would also be better for paddle board yoga. As we’ve discussed, the size of your board will be a determining factor in how stable your board is on the water. 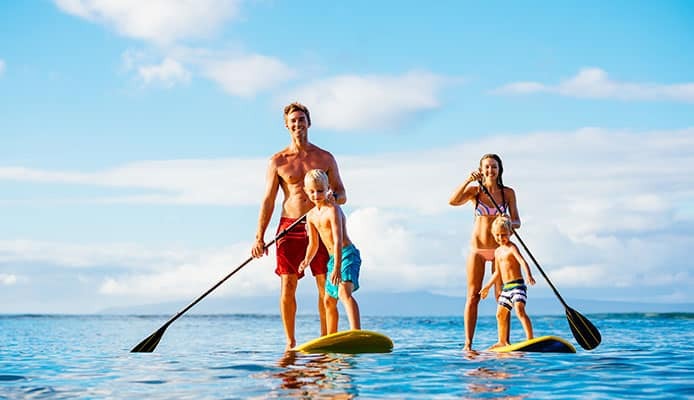 Isle SUP paddle boards that are larger in size will be more stable, which makes them great for certain paddle boarding activities or for beginner riders. However, you may feel that the material of the board will also determine how stable a board is, but Isle ensures all their designs are stable. An Isle touring SUP board, which may be made of fiberglass, will be just as stable as an Isle inflatable SUP board. Different Isle SUP paddle boards will be made of various materials based on their design. Most paddle boards are made of plastic, fiberglass, or are inflatable. Isle touring SUP boards may be made of fiberglass or plastic, but they also have Isle inflatable SUP designs too. An Isle airtech SUP is another one of their inflatable options, which can help save money. In general, Isle SUP boards that are made of fiberglass will be more expensive. Isle inflatable SUP boards are made affordable for paddle boarders on a budget. It may help you to make a choice by learning the difference between plastic and fiberglass paddle boards and fiberglass versus inflatable paddle boards. Q: Why choose Isle SUP before other stand up paddle boards? A: For quality and reliability. Isle is a company that strives to deliver the best to its customers. Other stand up paddle boards don’t match the quality of Isle. Their designs are eager to encourage people to get out on the water and explore. They have products for every budget but ensure that money doesn’t always mean quality. An Isle inflatable SUP board may be less than an Isle SUP board made of fiberglass, but both products are made to the company’s high-quality standard. Isle SUP board reviews are another indication that this company is going places. Isle has become a reliable and favorite go to brand for many other paddle boarders. Their designs are often the best out of the competition and offer the best performance. You can check other inflatable stand up paddle boards and beginner stand up paddle boards to help determine which would be best for you. But Isle is a top choice for many paddle boarders. Q: How to clean and maintain an Isle paddle board? A: Since all Isle SUP paddle boards are designed for water and waterproof, they can be easily rinsed off after an adventure. If you rinse your board after every trip and ensure that it is properly stored, it shouldn’t have to be cleaned. However, if you do find yourself in need of specific cleaning instructions, they should be provided with your purchase. Due to the variety of materials that are used for Isle SUP boards, you should look to the specific instructions provided with your purchase regarding the care and maintenance of your board, which can help you avoid damaging your board. Every time you clean your board, you should rid it of any dirt or sand. It should also be stored completely dry to avoid any issues with mold or rot. The better you care for your board while it is in and out of the water, the longer it will last. It will also ensure that you stay safe. You may also want to look at paddle board accessories like SUP board bags, which can give your board more protection and provide better care. Q: Are inflatable stand up paddle boards safe? A: Stand up paddle boarding is safe, but there are always steps you can take to ensure your safety. There are a few things you should never do, which can help keep you safe. You can also review a standup paddle boarding gear and equipment checklist before every trip to ensure you have everything you need. Even if you fall, you can get back on your SUP. Everyone falls, even the pros. So, don’t worry if you take a few spills. You’ll get the hang of it in no time. If you are looking at an Isle inflatable SUP or an Isle airtech SUP, these boards are just as safe as any other Isle SUP boards. However, to ensure your safety you will want to review the instructions provided with your Isle inflatable SUP board. There will be instructions on how to properly inflate your board and how to use accessories like electric pumps to make the time go faster. There are lots of reasons why you should try paddle boarding that entice you to try the sport, but once you are on the board you will likely be hooked. Paddle boarding is a fun and creative way to get out on the water and anyone, regardless of age or skill level, can give it a try. If you are looking to invest in your own board, Isle is a premium company that can provide you with everything you need to get started. If you know exactly what you want or need, you can easily find the best Isle SUP boards to choose from. A top rated Isle inflatable paddle board will have you going to new places and on new adventures with ease. Do you own one of the Isle SUP boards that made it onto our list? Let us know how it has worked for your paddle boarding needs in the comments section below.